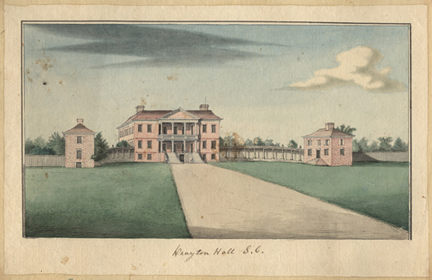 Four years ago, an old watercolor of Drayton Hall mysteriously surfaced, showing a prominent feature that had been lost to history. The feature — a colonnade that linked the main house with its two flanker buildings– had never been seen before by anyone with the National Trust for Historic Preservation.The image, which dated from 1765, only triggered more questions. Among the biggest was this: What was the colonnade’s architectural role? Was it built to provide shade and shelter to those walking between the main house and its support buildings or simply to provide a visual screen between the eastern and western sides of the property? This summer, Drayton Hall’s archaeologist Sarah Stroud attempted to unearth some answers. A case of beer was riding on the outcome, but more about that later. In 2009, an archaeological dig found a prominent soil stain believed to be the colonnade, but only one wall was found, indicating the structure was more of a screen. Stroud thinks the colonnade served a more significant purpose. She thinks the columns and wall were separated by several feet and supported a roof that would have provided a covered walkway. So she mapped out a 10-foot by 15-foot plot on the northern side of the house that she hoped would contain new evidence of the wall. As her dig winds up this week, she acknowledges that it didn’t. But her efforts weren’t in vain. The dig did uncover other evidence, such as traces of small post holes, more clay pipe stems than anywhere else on the property dug up so far, a tiny brass door pull, a glass perfume bottle stopper and a large square feature in the center that Stroud is still contemplating. The wall’s exact location and curvature is unknown — as are the materials from which it was built. Stroud says she might have struck out because she was digging in the wrong spot or because the earth there was disturbed to remove any traces of the colonnade, which is believed to have been removed during the Revolutionary War. If Stroud ultimately loses the beer bet, she will gain a little job security as her hunt for answers goes on. “It means I’ll get to dig again,” she said. Copyright © 1995 – 2011 Evening Post Publishing Co..